Prior to the ceremony, we will hold a reception from 3:00-5:00 pm on the back patio/terrace of the Student Union. Undergraduate and Graduate students and their families are invited to participate in this festive event with faculty and staff members. Refreshments will be served. Students do not need to RSVP for this event. Candidates for the ceremony need to report to the Field House by 5:00 pm; Gampel will open its doors to family and friends at 5:00 pm as well. Graduates will be limited to 10 guest tickets each for the Commencement Ceremony. If you or your guests are in need of additional tickets or accommodations, please email acadprog@uconn.edu and include your name, cell phone number, and the number of additional tickets you are requesting. All names will be added to a wait-list, and as Commencement grows closer our office will contact you regarding your request. We will do our best to meet all reasonable requests. Directions & Parking information for the Commencement Ceremony can be found here. Fill out the Commencement "Huskies Moving On" Survey by Tuesday, April 30, 2019. The survey will be available in early April, and we will send an email reminder when it is active. If you do not complete this survey by April 30, we will require you to complete the survey on paper before issuing you your “walking card” at the Commencement Ceremony sign-in table. Graduating soon? Follow these steps to a successful graduation. 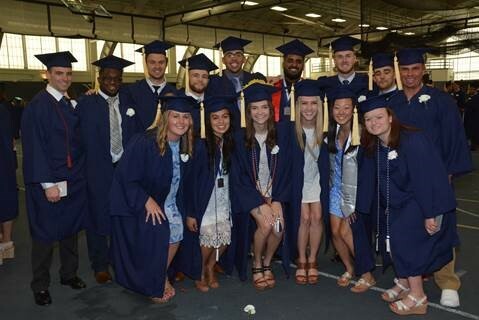 Undergraduate students who graduated in December 2018 or who will be graduating in May or August 2019 from the College of Agriculture, Health and Natural Resources and the Ratcliffe Hicks School of Agriculture will be recognized for completion of their degree requirements on Saturday, May 11, 2019, beginning at 6:00 pm in Gampel Pavilion.